For those of you who missed it yesterday, here's the full transcript of Ron Dennis' fascinating press conference yesterday. Hey Nate: WHat's your take on Kimi's comments about the card during yesterday's press conference? Ferrari reliability issues & the car behaviour changing every lap?? @rockedin123: I think its natural to encounter problems like that in testing, especially if the team was changing things around during the day. The conditions also don't help in Barcelona, it's pretty cool so it's hard to get the tyres working. Hi Nate, What is happening with ferrari? They are going down again? @Mithesh: It's too early to presume anything - though it seems most of the Tifosi assumed Ferrari were back on top because of a few days at the top of the timesheets earlier this winter. @PuneetVarandani: Well, I personally don't know the chances because I'm not a McLaren mechanic, but I would say the team is in dire need of something today. 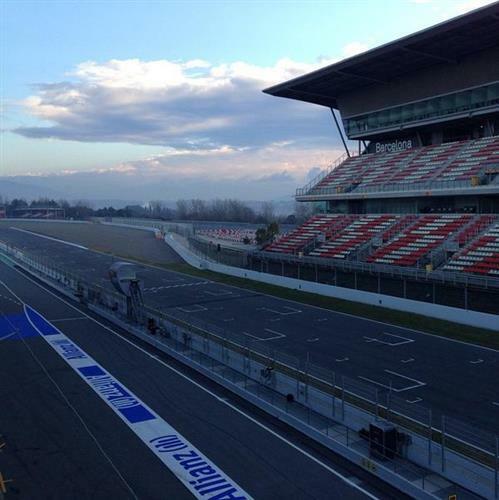 It has only recorded 209 laps in nine days of testing. Red Bull recovered fine from a similar position last year, of course, but it's a far from ideal position to be in. The clock hits 9:00 and the session goes green - Vettel, Rosberg, Maldonado and Verstappen all head straight out onto the circuit. I can see aero sensors on the Toro Rosso and Lotus, though Maldonado has returned to the pits after his installation lap. @Nate - What do you think is most unusual from what Ron Dennis said in the press conference? For me, the fact that he isn't releasing the info the team has in that 15 second gap seems unusual. Guess we'll have to wait and see what Charlie Whiting has to say. @SD: The general feeling of the paddock here is that it was a strange press conference. I can't understand, personally, how McLaren feels it did a thorough investigation of the crash when Ron Dennis then admitted they haven't even spoken to Alonso about his memory of the crash. Good morning Nate,can you tell us about the weather? @rizwan: Good morning. Rather chilly this morning. It's 7 degrees Celsius out there, while the track temp is creeping towards 12 degrees Celsius. Not much wind today though. At what time are Force India Joinng???? @SakethRam: Force India is hoping to leave the garage for the first time this afternoon. We will obviously keep you abreast of the latest developments as we get them. Button joins the circuit and that means we've seen every driver except Hulkenberg. I am just curious.. you are a team of how many people ? @rizwan: There are two of us, myself and my esteemed boss Laurence Edmondson, who will be joining our live commentary later. @Nate - Would Mclaren have any reason to restrict data being released to the press? And would the findings of the official FIA report be released to the public? @SD: No, they wouldn't, and I'm not suggesting they are lying or holding anything back. I think the way McLaren has handled the whole thing has been sloppy and every time they address the situation they leave more questions than answers. "Fernando is devoid of all injuries"
Who says that? How impersonal can you get? He might as well have been talking about his vacuum cleaner ... devoid of any loss of suction. After a brief flurry of activity everyone has returned to the pit lane. @lakespookie: That's true, but nobody is asking them to release data of the car - unless something failed, as it could present a safety risk, not just to Alonso or Button but to other drivers. 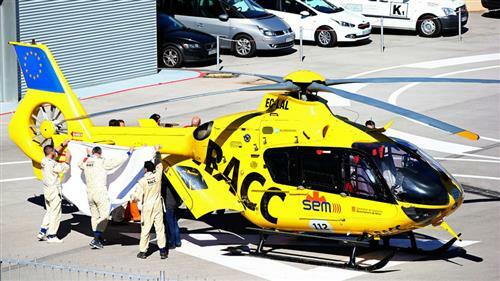 The data McLaren did not release was the G-force readings recorded in the crash. For those unfamiliar with aero sensors, the teams use these during testing to measure air flow around the car. It's a pretty tell-tale sign when a team is doing aero work rather than focusing on full performance. 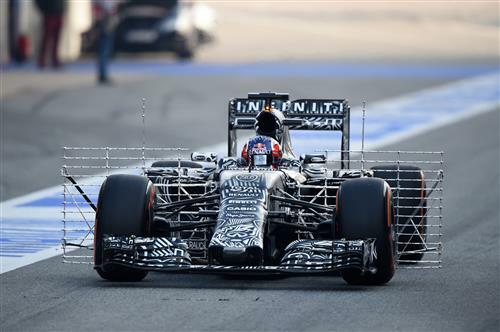 Though that's not to say a team has to have aero sensors to be doing an aero test. Only Vettel's red Ferrari out there at the moment. @nate how much do you know about the mesurment equipment is it an array of Pressue transducers or pitot tubes or some other setup??? @lakespookie: The aero sensors on that Kvyat picture are known as 'aero rakes' and are made up of Kiel probes. Hi Nate.Any news from Force India? Is the VJM08 ready to go out today? @Pavan: Our last update was that the team is working on the car and hopes to get it out this afternoon. I am not sure about the effectiveness of the aero sensors. Yes, (I assume) they will provide airflow readings, but they will also produce drag and influence airflow....meaning the readings will be of non-valid situations unless they plan to go racing with those attached. @Aero: They wouldn't be used if they weren't effective. 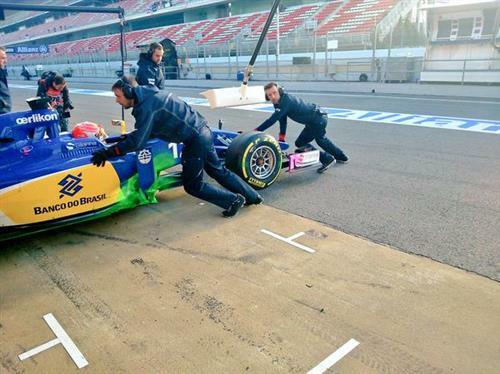 Testing is not just about setting headline times and being top of the timing screens. The amount of data collected at these tests is huge, even by a team like McLaren having problems left right and centre. Measuring the air flow on the car allows the teams to calibrate the data they get from the wind tunnel, too. Is that a Red Bull or a rolling Waffle House? @mfbull: The latter, I think. Half an hour in and Nasr's 1:27.968 is the headline time so far.